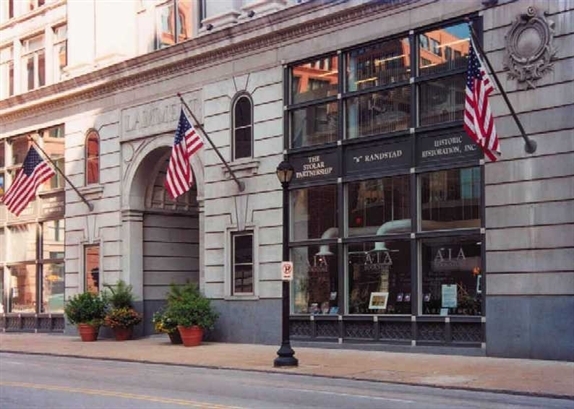 The St. Louis chapter of The American Institute of Architects was established in 1890 with twelve charter members, with Mr. Pierce P. Furber serving as the first president. Or, the St. Louis Chapter was established in 1884 with eleven chapter members and Henry G. Isaacs as the first president. The blurring and scarcity of records leaves uncertainties as to what ideology was in place at the start, what was accrued, and as to who and what influenced early changes of direction. With much to account for and to commemorate, AIA St. Louis commissioned its history in observance of the centennial dating from 1891, the year of the charter on its office wall. One of the first research findings was that the Chapter could have observed another year of origin just as legitimately established and chartered seven years previously. In common with other professional organizations, the Chapter emerged out of mixed priorities as to what it should be and do. Within a few years, assorted objectives were expressed from within impulsively organized peer-group institutes, associations, leagues, chapters, and regional and local clubs. Carolyn Hewes Toft, Hon. AIA St. Louis has tracked their comings and goings by following often faint trails in documents, library archives and nineteenth-century architectural magazines. She traces their mergers and splits, and their gravitations between clubby coziness and idealistic outreach. She finds that the St. Louis Chapter of 1884, having hung by a two-member thread for some months, became viable enough to survive through reorganization in 1890 and rechartering in 1891, and that born-again year is the one that is commemorated. By their act of affiliation, the founders were responding to the need for a professional esprit de corps and for common ground where sometime competitors could unite in furtherance of their mutual interests. Chapter meetings provided forums for talks by eminent visitors, and sympathetic ears for the recounting of difficult experiences arising from acts of God and the sponsors of design competitions. Early concerns of the AIA were to limit use of the term "architect" to those with professional education and experience in the arts of building and design, and to advocate state accreditation. Throughout the country, master builders (or "undertakers"), ordinary builders, contractors, carpenters, and draftsmen were identifying themselves as architects, accepting commissions for design and construction, and performing architectural services. Some performed badly, and some demonstrated remarkable aptitudes and intuitions in design and building, but lines of responsibility were haphazardly drawn. When the Chapter was founded, St. Louis architecture was about midway between the French colonial cluster of plastered and whitewashed log houses on the riverfront and today's new skyline. Dwellings, warehouses, schools, and tall spired churches testified to bold, energetic initiatives of the city's forerunner architects. Their designs were usually eclectic, with essences of historical styles blended into compositions that sometimes were incongruous. To an impressive extent, however, borrowed elements were applied with adroitness, sensitivity, vivacity, and sense of appropriateness that increasingly command respect from modern viewers. The early generations of defacto architects were generally well educated but not technically trained. A landmark event in St. Louis architecture was the arrival in 1839 of a young Englishman, George Ingham Barnett, who had received professional training in London under Sir Thomas Hine. Barnett was at once enlisted to make a perspective drawing of the first unit of what is now the Old Courthouse, thus relieving an embarrassment of architect Henry Singleton. Singleton had won the design competition with plans and elevations, but apparently - in common with most architects in this country at that time - had no training in perspective drawing. Barnett was to St. Louis what Benjamin Latrobe had been to Washington, D. C., thirty-six years earlier upon appointment by President Thomas Jefferson as Surveyor of Public Buildings and Architect of the Capitol. Each introduced technical architectural qualifications to his adopted city happily combined with design talent. When St. Louis was growing into the nation’s fourth largest city, specialized architectural knowledge became essential as construction grew in scale and complexity. Yet, when the American Institute of Architects was founded in 1857 there was not one school of architecture in the United States. The first American school of architecture was established at the Massachusetts Institute of Technology (MIT) in 1866. Some of St. Louis' most respected practitioners in subsequent years were graduates of MIT, or of new architectural schools at Columbia or Cornell Universities, with further training in Paris at the Ecole des Beaux Arts. Some early schools, including that of the University of Illinois, founded in 1870, were adjuncts of engineering departments. In 1890, Harvard established the first architectural school with orientation to design as art. John Albury Bryan, pathfinder through St. Louis architectural history, related that the first degree in architecture awarded in St. Louis was to Harry Newington (who later practiced in New York City) in 1881by the O'Fallon Polytechnic Institute. The school, affiliated with Washington University, offered art and design classes for manufacturing and mercantile applications. Later the university's Manual Training School offered similar courses. There is no indication that the Polytechnic actually had an architecture curriculum, and Newington's courses may have been custom crafted. The university did not then offer the degree, but its St. Louis School of Art and Design, a special department under Halsey C. Ives, offered classes in drawing and design applicable to basic architectural training. In 1881, this school was moved into the Museum of Fine Arts building at Nineteenth and Locust streets. The building was donated by merchant Wayman Crow and designed by Peabody & Stearns of Boston. There it shared space with the antecedent of the St. Louis Art Museum. Esley Hamilton relates that the St. Louis Architectural Club, founded in 1894 by a group of young architects and draftsmen to further their education, functioned as an atelier. For some years, finally in its own quarters in a converted stable-the club offered the city's only classes in architectural design, construction, and allied arts on the professional level. Some members of the AIA Chapter joined the Architectural Club, delivered lectures, and in many cases provided on-the-job training in their firms. The Washington University School of Architecture, still the only one in Missouri, came into being at the downtown campus with three students in 1901 in association with the School of Engineering under Frederick M. Mann. On the new Cope & Stewardson campus, the schools jointly occupied Cupples Hall No.1 with the Architectural Club, conducting the university's evening classes in its own quarters for nearly two decades until the school moved to Givens Hall in1933 and became free standing. One of the university's first graduates, Lawrence Hill of the class of 1901, returned in 1914 as professor of architectural history. The main focus of architectural history until well into the twentieth century was on classical and other academic design prototypes, and not many architects had, or would take, time to become interested in traditions of their own country and region, or in the vernaculars of their obscure or anonymous predecessors. On his first visit to St. Louis in 1913, John Albury Bryan was immediately impressed by the character and variety of buildings that he saw in a long ride on a Delmar streetcar. In a memoir he wrote admiringly of hotels, churches, an early movie theater, some Queen Anne flats, and a funeral parlor. Bryan worked under George E. Kessler, studied architecture at the Architectural Club and at Columbia University, became a design assistant with LaBeaume & Klein, and kept personal files of St. Louis buildings and their architects. For the national convention of the American Institute of Architects in St. Louis in 1928, the Architectural Club sponsored publication of his Missouri's Contribution to American Architecture, a copiously illustrated trailblazer book, still a prime reference. Although the St. Louis Chapter had the expertise for useful guidance toward a public point of view in complex issues of urban design, architects tended to remain aloof from public discussion until the mid-twentieth century. Extravagantly grandiose and inherently unworkable City Beautiful schemes for the riverfront, put forth during decades following the Louisiana Purchase Exposition of 1904 and lavishly reported and illustrated in the newspapers, received no critical examination by the press or the Chapter. Most of them bore the stamp of the Chapter's most stalwart members. Their colleagues, usually with divergent opinions on almost any issue but neutral in public, were inhibited, too, by Institute strictures against questioning or challenging each other's projects outside their own circles. Among other things that the Gateway Arch is a monument to is its commemoration of the Chapter's taking a leadership position in the public arena, with significant benefit to community and nation. In 1957, the Arch project had reached an almost terminal dead center, largely because of dreadful complexities of relocating railroad tracks that crossed the site. The Chapter president, Eugene Mackey, Jr., and Eric W. Smith, Jr., led their troops in support of getting the job done during months of crusading in public and private forums. Mary Henderson Gass addresses the Chapter's modern era, the post-war years of land clearance, public housing, civic projects superimposed on the old downtown grid, and adaptive reuse of historic properties. During those years, the public became a party to nearly all major redevelopment including private projects built with public funds or benefiting from tax abatement; many also involved the taking of property from long-established use, which required at least public acquiescence, for radical redevelopment. The questions were not just about architecture but about conceptions of land use and urban design more far-reaching than had previously challenged either the public or the professional experts. Never had the planners, architects, city administration, financial interests, and citizens of St. Louis been confronted with such perplexing choices, or with more possibilities of irreparable damage from well-meaning but badly informed and short-sighted decisions. Yet there they were, the suddenly urgent and politically sensitive problems of design and social priorities, especially in the downtown core. In St. Louis, during the urban-renewal years of the early 1960s, redevelopers and funding agencies tended to have the last word in large-scale replacement planning and design. An authority charged with renewing bruised and broken parts of the city needed godly wisdom and vision, but those qualities usually were attached to hindsight. Unfortunately, the big complexes of elevator housing for low-income families and the Mill Creek Valley commercial redevelopment came too precipitately to serve as teaching examples of what, not to do. Architecture could have served more effectively under a firm master plan with an uncommonly judicious mix of practical and idealistic aims, but some of the problems were beyond purely architectural solutions. With hesitation at first, but with increasing readiness to contribute from its professional qualifications, the Chapter took two major steps toward educating the public in urban issues and itself in give-and-take colloquy. Over several decades, it has organized and provided leadership for tours, talks, workshops, demonstrations, exhibitions, and publications, still being carried out and some widely emulated; and it has taken forthright positions on issues central to the public interest: the Gateway Mall, a hotel parking garage under Luther Ely Smith Park and the proposed removal of the remaining Cupples Station warehouses, among others. The Chapter assembled specialists for an influential study and report on the conservation of Forest Park. In its annual Charrette, the Chapter has focused attention on long-postponed civic management by awarding prizes for studies and applicable concepts. These included design problems, such as a pedestrian bridge over Memorial Drive and I-70 to connect the Jefferson National Expansion Memorial and the Old Courthouse, and land use problems, such as redevelopment of the industrial district south of the Memorial grounds. Some proposals and declarations offered by the Chapter have swayed a course of action, and some have not (as yet), but they have contributed to understanding of the options. In its first century, the St. Louis Chapter, AIA, grew from a self-centered exclusive club to a potent influence on its community's environment. In its next century, the choices are likely to be harder, the options fewer, the improvements much more costly, and the social, political, and economic priorities more competitive. Toft, Carolyn Hewes, et. al. The Way We Came: A Century of the AIA in St. Louis. Saint Louis, MO: The Patrice Press, 1991. With permission of George McCue and The Saint Louis Chapter of the American Institute of Architects.